Once again, I am behind on my blog because we've been traveling! Have I mentioned how much I love my life? 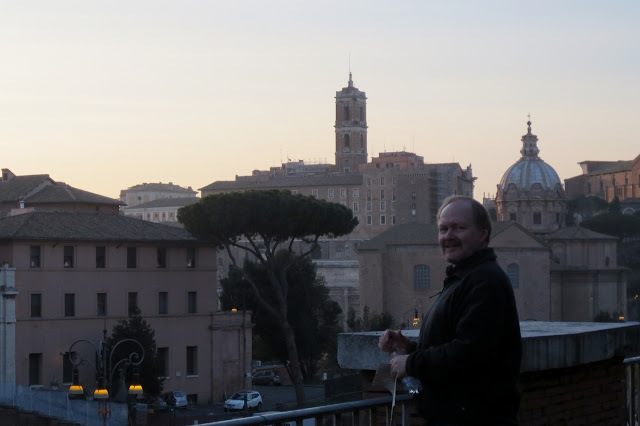 This trip, Ron had to go to Rome for 2 weeks for a course he had to take. So, I went with him. 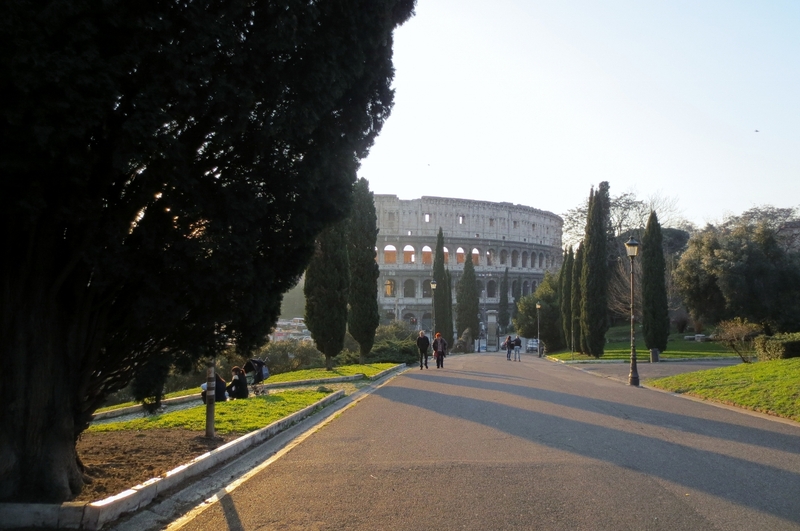 The thought of sunshine, Italian food and sightseeing was just too much of a temptation. This time we chose our own hotel instead of the one recommended to us by the course. We wanted one right in the midst of everything. 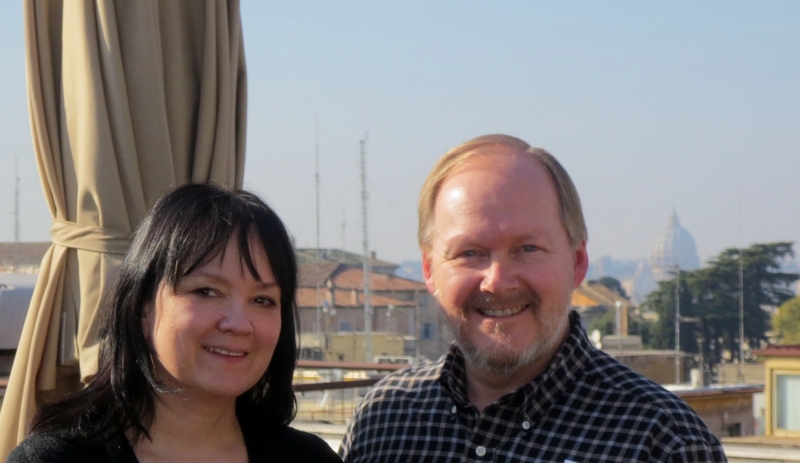 We chose Hotel Artemide. It was a wonderful choice! Below is a picture of our hotel. When we booked the hotel online there was only one room left. When we checked in though, they told us we had been upgraded to a Superior double room. 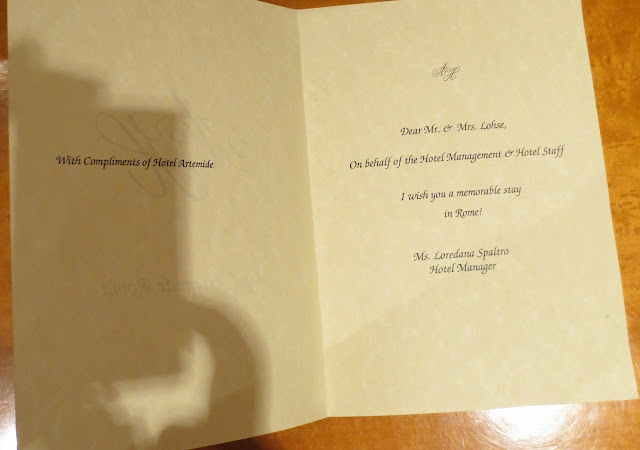 When we arrived, our room was not yet ready but they gave us a coupon for 2 free cappuccinos or Proseccos that we could get on the roof top bar (everyone gets these even if their room is ready). So, up we went. 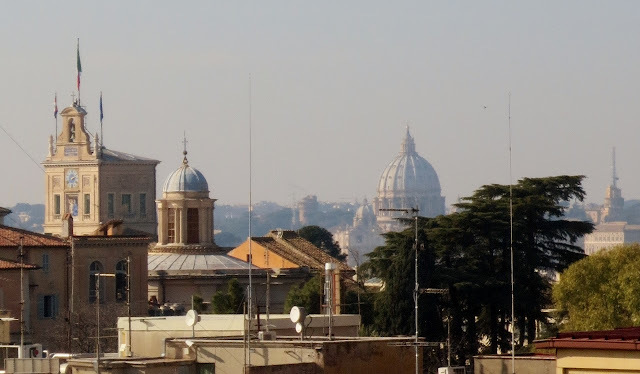 There is an amazing view there and you can even see St. Peter's Basilica from the roof. And the waiter was very nice and took our picture. 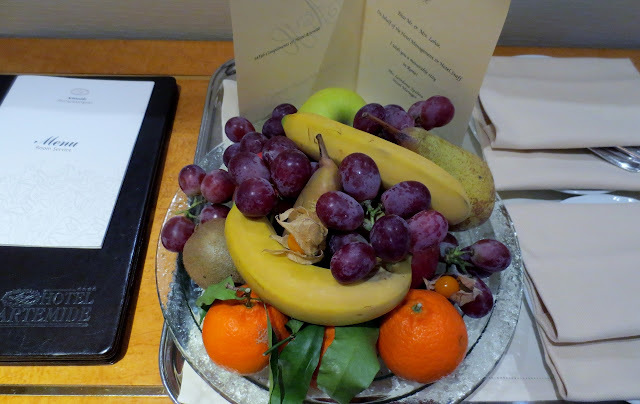 Afterwards we went down to our room and found a wonderful plate of fresh fruit waiting for us. And a very nice note welcoming us to the hotel. 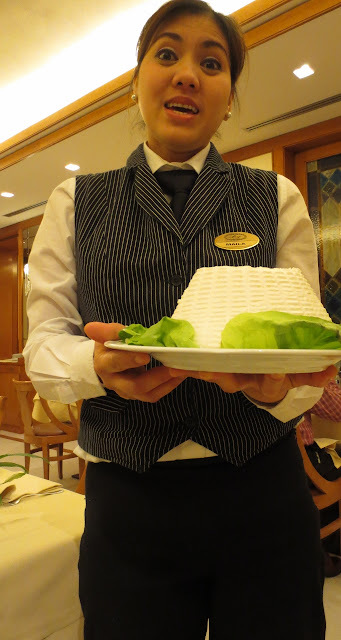 I decided I will go ahead and talk about the breakfasts at the hotel here on this page of the blog even though we did not eat breakfast the first day. It is WONDERFUL! Eggs, bacon, ham, fruit, pastries, yogurt, just too many things to list. They also bring coffee, tea, espresso, cappuccino, hot chocolate to your table and they had lots of different kinds of juices. 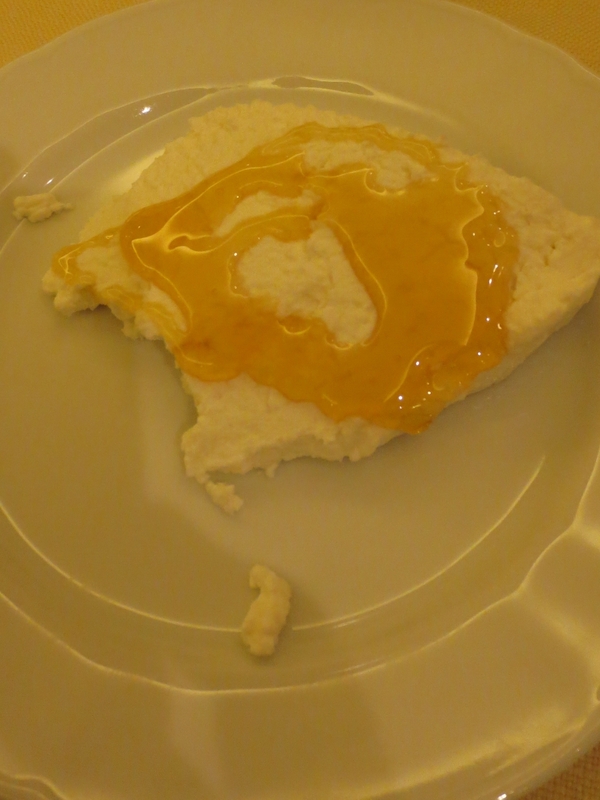 And then .... when you are seated with your food they come around and offer FRESH made ricotta cheese. They suggest that you drizzle it with honey so of course I had to try it. YUMMY! Who would have thought ricotta and honey for breakfast? After checking into our room, we decided to head out walking to see what we could see. We came across a flight of stairs and had NO idea where it would lead. 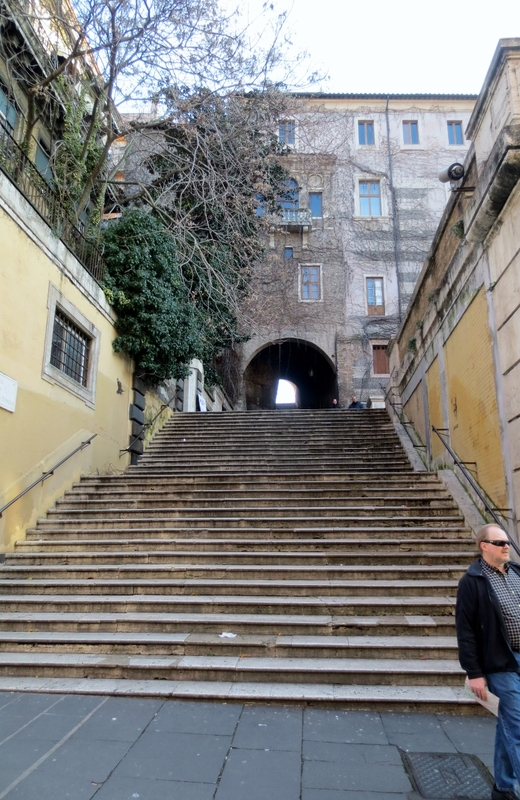 But, I am trying to lose weight and decided climbing stairs would be a good way to do it. And boy am I glad we did!! 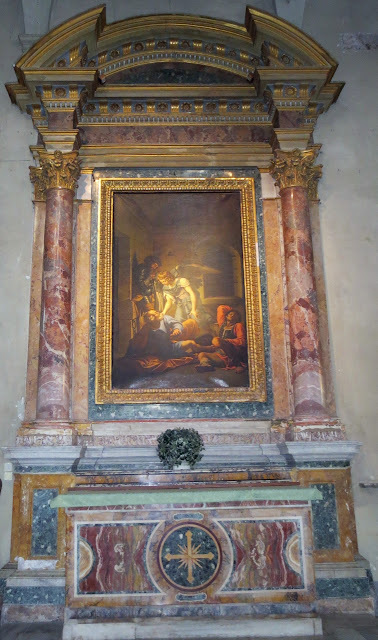 I had not read anything about the Basilica Di San Pietro in Vincoli but figured it had to do with St. Peter. And boy was I right! It turns out that the church was built in 432-440 to hold the chains that bound St. Peter when he was imprisoned in Jerusalem. 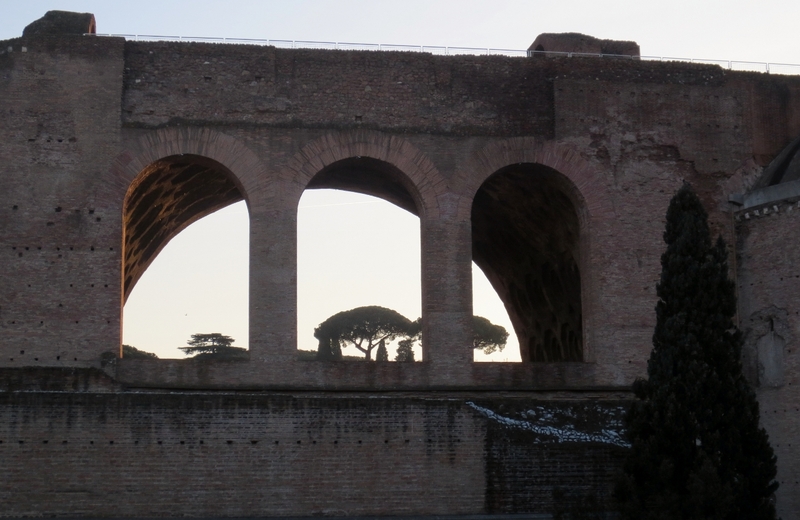 The Empress Eudoxia, who received them as a gift from her mother, presented the chains to Pope Leo I. 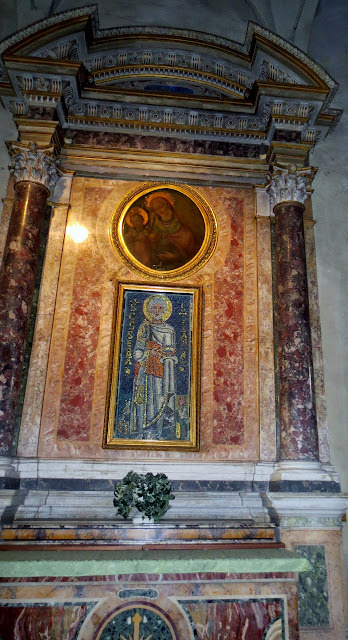 Supposedly, when Pope Leo compared them to the chains of St. Peter's final imprisonment in the Mamertine Prison in Rome, the two chains miraculously fused together. 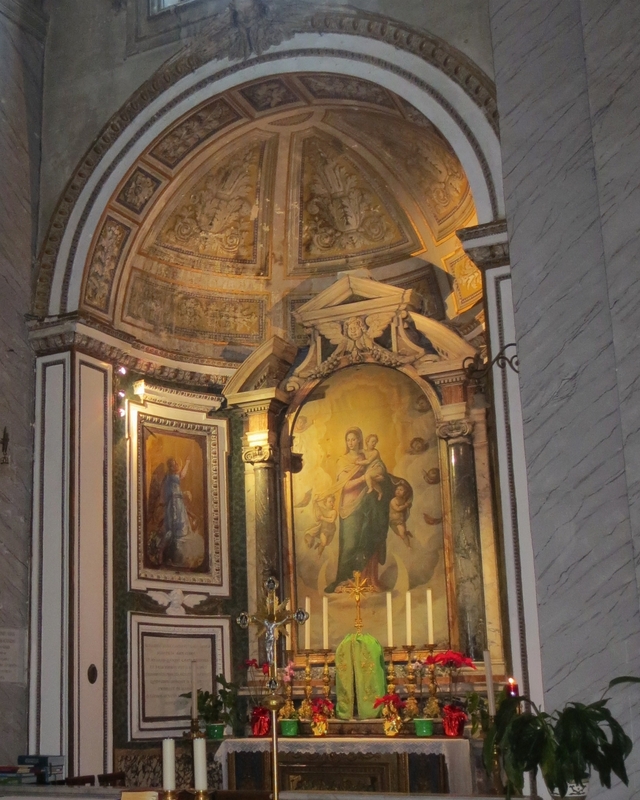 They are kept in a reliquary under the main altar in the basilica. I found some of the things in the church a bit creepy, and I wasn't able to find a book to explain the meanings of some of the items. :( I'll have to do more searching. 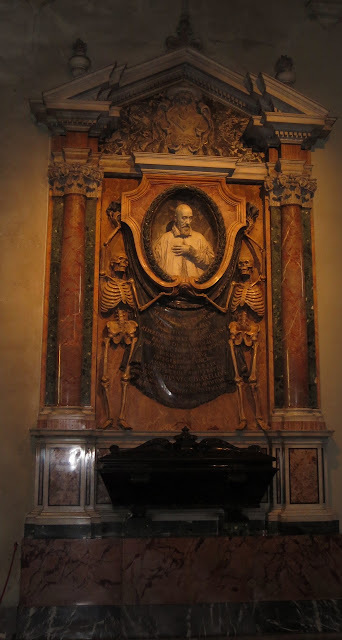 One of the things I found a bit creepy is the tomb of Cardinal Cinzio Passeri Aldobrandini (1551 – January 1, 1610) which includes the Grim Reaper. 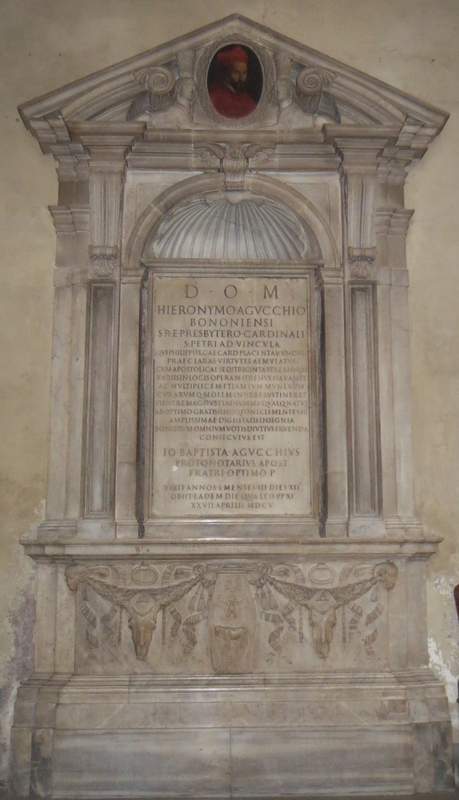 Tomb of Mariano Petro Vecchiarelli. I did not find out any information about him but I found this more than a little creepy. 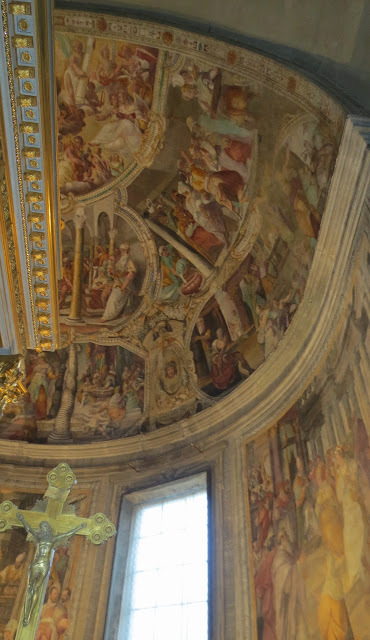 On the ceiling is an 18th century fresco that is titled The Miracle of the Chains which refers to the miracle that allegedly happened when the chains were brought to Rome and when brought into contact with the Carcere Mamertino chains miraculously fused together. 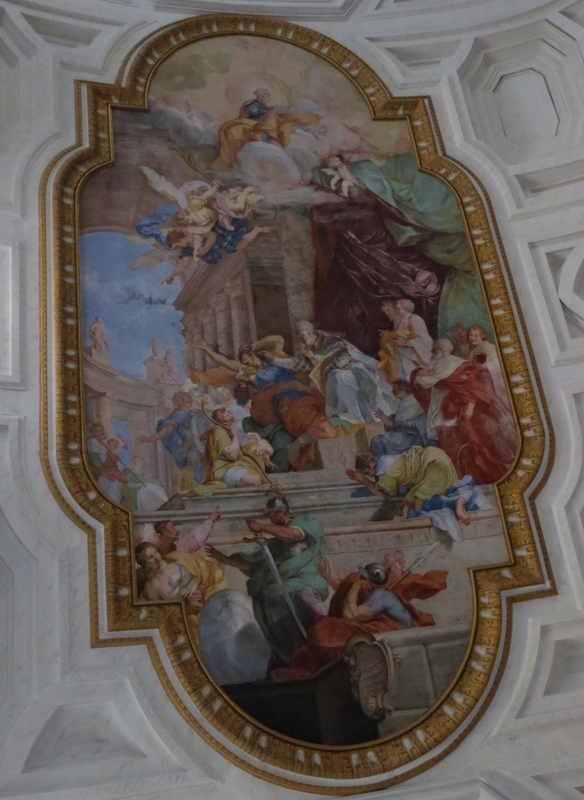 The painting was done by Giovanni Battista Parodi in 1706. 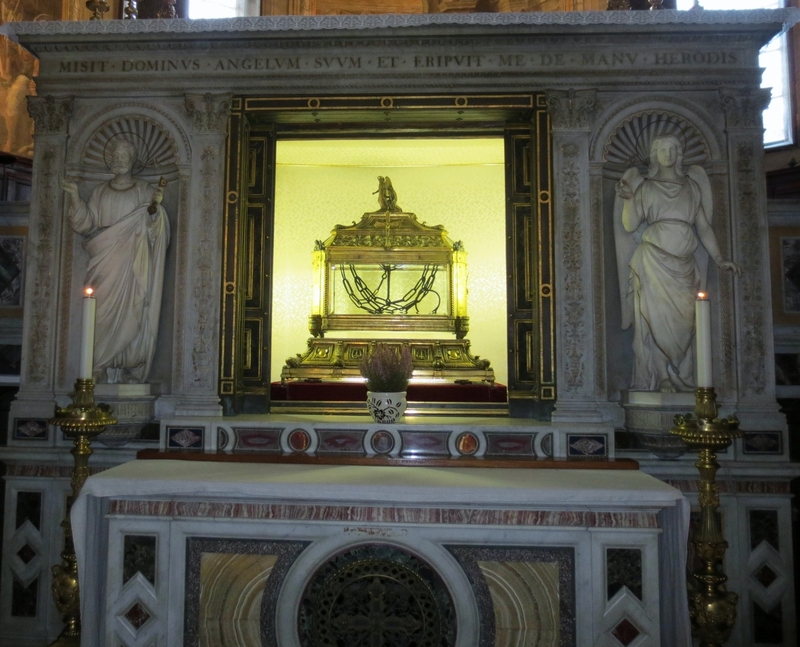 The chains that are said to have bound St. Peter. Below are some paintings that I could not find out any information about. 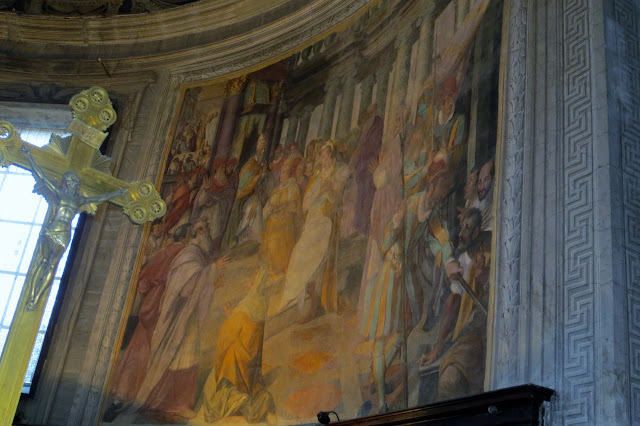 Frescos by Giacomo Coppi (1577) in the raised tribune showing scenes leading up to the Crucifixion of Christ. Below is the tomb of Pope Julius II that was done by Michelangelo and his assistants. It was commissioned in 1505 but was not completed until 1545. 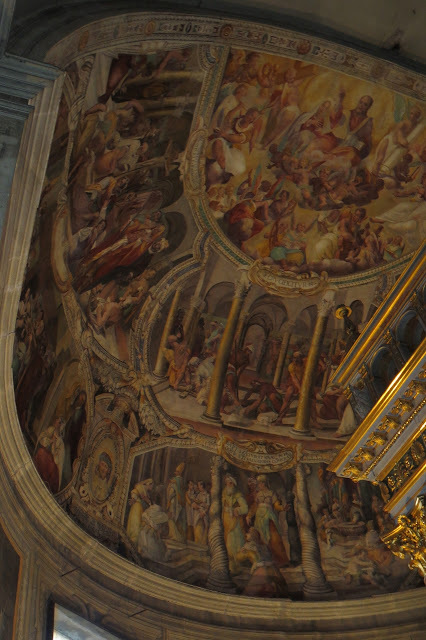 It was intended for St. Peter's Basilica but was instead placed in the church after the pope's death. Originally it was to have 40 statues but ended up with fewer than 1/3 of the figures originally planned. 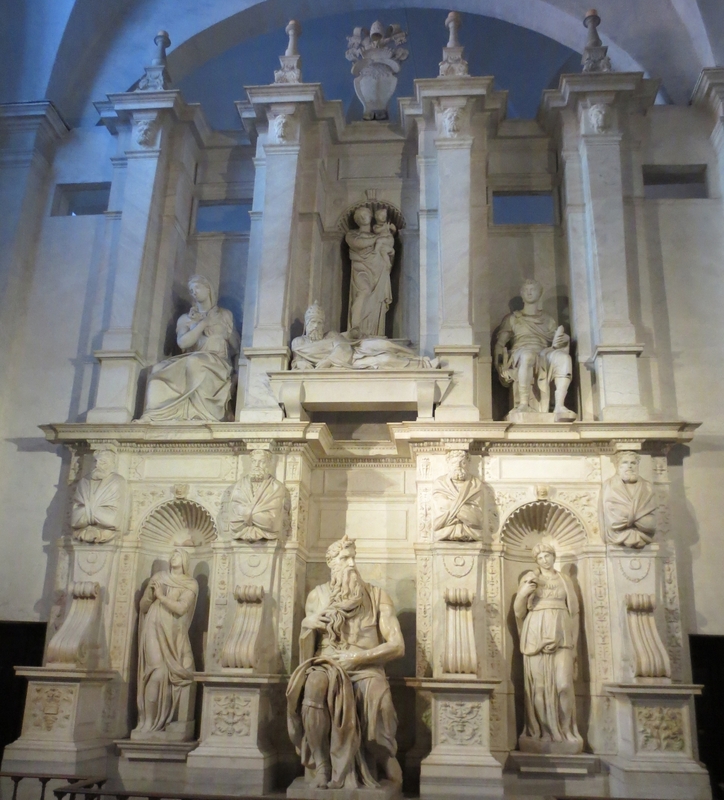 1505 – Julius commissions the tomb from Michelangelo. He spent 6 months choosing marble at Carrara. 1506 – Michelangelo returns to Rome because there is not enough money for the project, and is dismissed by a very angry Julius. Michelangelo moves to Florence until Julius threatens to wage war on the state unless he returns, which he does. 1508 – It is said that Donato and Raphael are jealous that Michelangelo got the job and they convinced the Pope that it is bad luck to have his tomb built during his own lifetime. They convince the Pope that Michelangelo's time should be spent on the Sistine Chapel's ceiling in the Vatican. 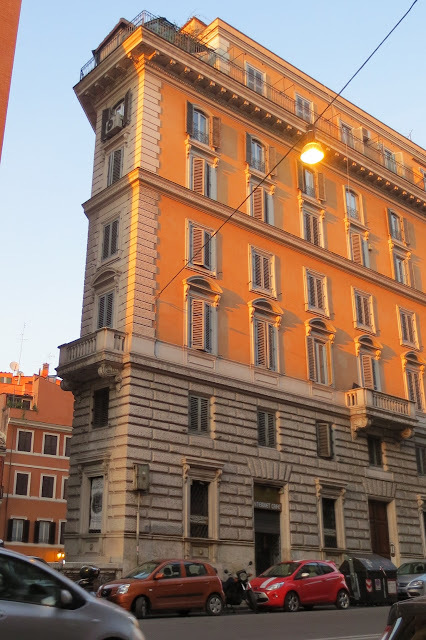 They assumed that Michelangelo, who was a sculptor would have a very difficult time completing such a huge project. 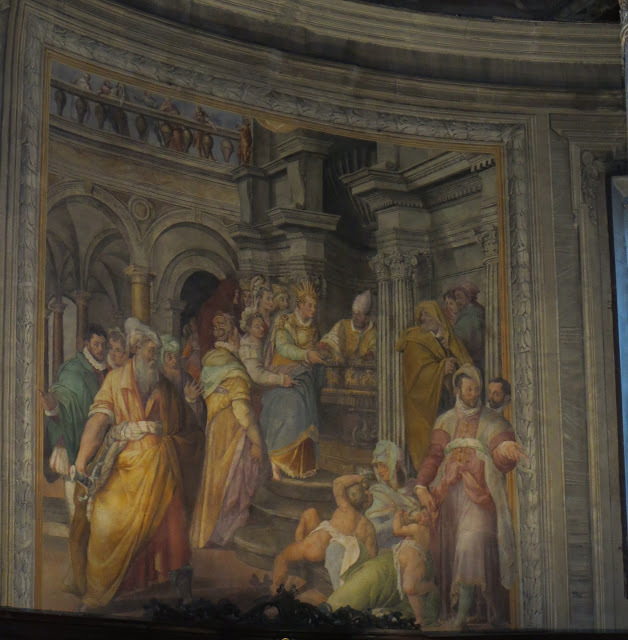 1512 – When Michelangelo finished the Sistine Chapel ceiling, he resumed work on the tomb. He finished three of the sculptures for the project: the Dying and Rebellious Slaves which are now in the Louvre in Paris and Moses which is in the final design. 1513 – Pope Julius died in February 1513 and a new contract was drawn up on May 6th which specified a wall tomb. On July 9th Michelangelo hired a stonemason, Antonio del Ponte a Sieve, to do the work of the tomb's lower part. 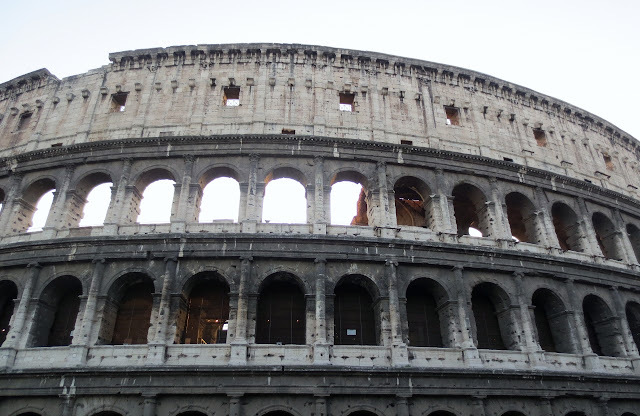 1516 – A new contract is made between Michelangelo and Julius’s heirs who demand the completion of the tomb. 1520s – Michelangelo carves The Genius of Victory and four unfinished Slaves which can now be found in the Accademia in Florence. 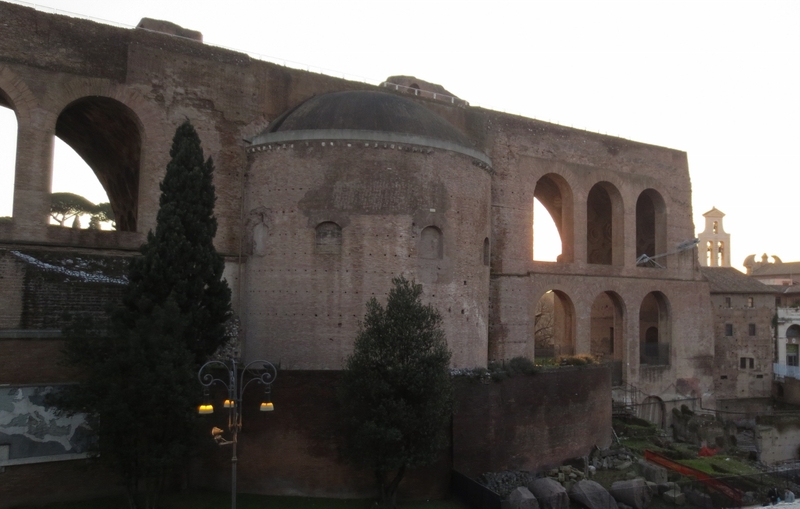 1532 – A second contract is made up Michelangelo and the heirs which involves a wall-tomb. 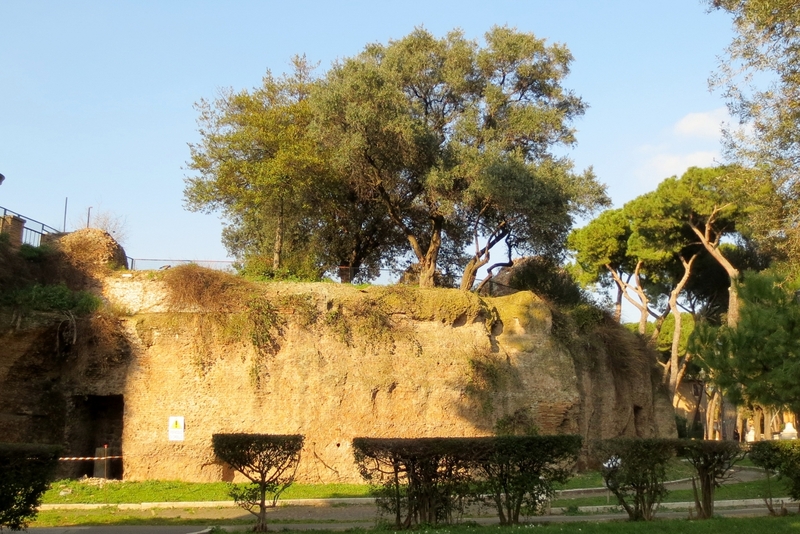 1542 – The wall-tomb is begun by Michelangelo after the final details are negotiated with Julius′s grandson. 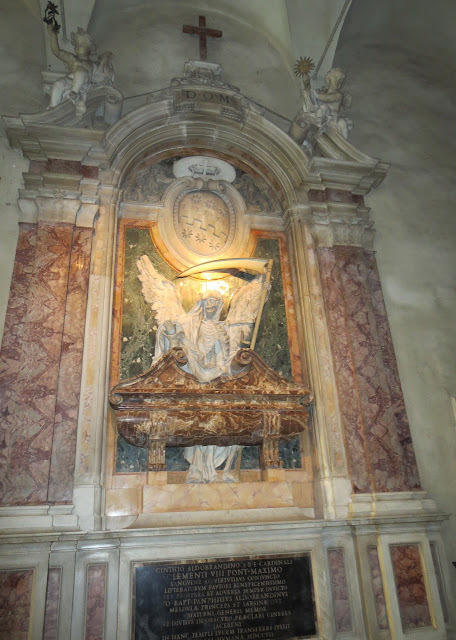 1545 – The final tomb is completed and installed in San Pietro in Vincoli. It includes Michelangelo’s Moses along with Leah and Rachel which are probably finished by his assistants on the lower level and several other sculptures that are definitely not done by Michelangelo on the upper level. Michelangelo felt that Moses was his most "lifelike" creation. Legend says that upon finishing it he hit the right knee commanding, "now speak!" because he felt that life was the only thing left inside the marble. There is a scar on the knee thought to be the mark of Michelangelo's hammer. Tomb of Cardinal Girolamo Agucchi (1555 - 1605). The Liberation of St. Peter is a copy of the painting by Domenichino. 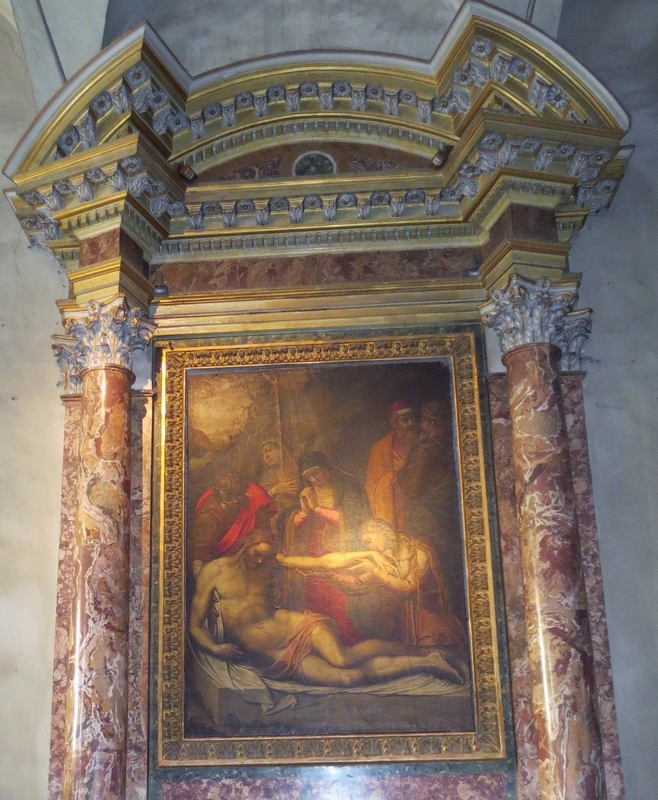 This is the painting The Deposition done by Pomerancio. The tomb of Nicholas of Cusa who died in 1464. 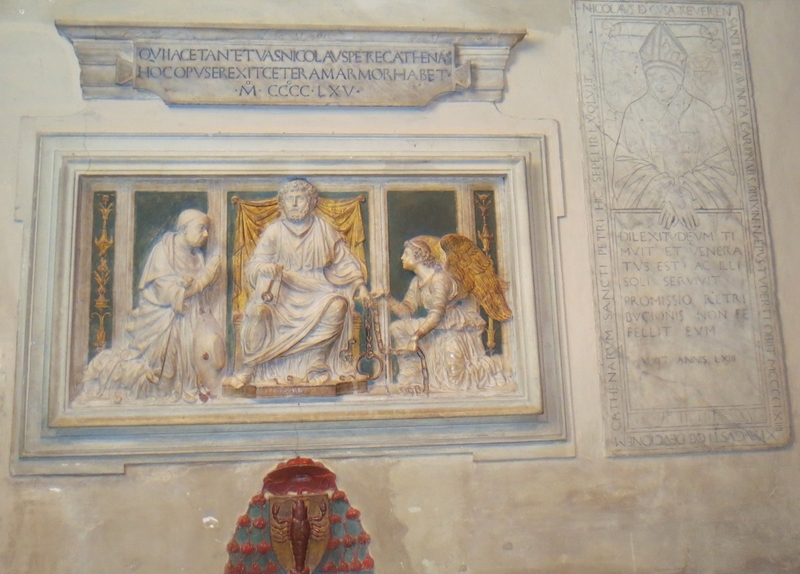 Next to it is a relief showing Cardinal Nicholas before St Peter done by Andrea Bregno. Below is the tomb of the artists/sculptors Antonio and Piero Pollaiuolo who were brothers. It was made around 1500 by Luigi Capponi. Above the tomb is the painting Penitential Procession during the Plague of 1476. The artist is unknown. We decide that it is time to keep walking. We're not trying to see anything in particular, just wandering around. We turn a street corner and guess what we see?!?!? 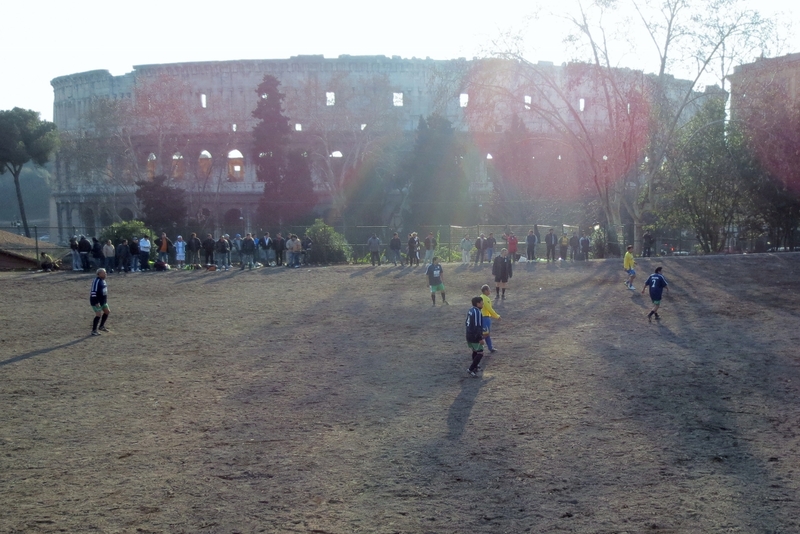 The Colosseum! I wonder what it would be like to play soccer right here next to the Colosseum every day? Are they in awe? Do they even see it any more? 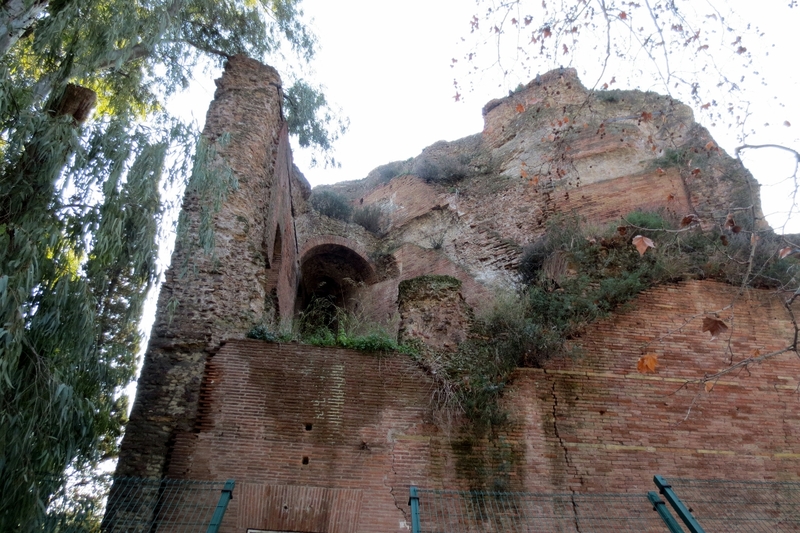 As we continue our walk with no particular route in mind, we come across the Baths of Trajan which were built starting in 104 AD and finished in 109 AD. 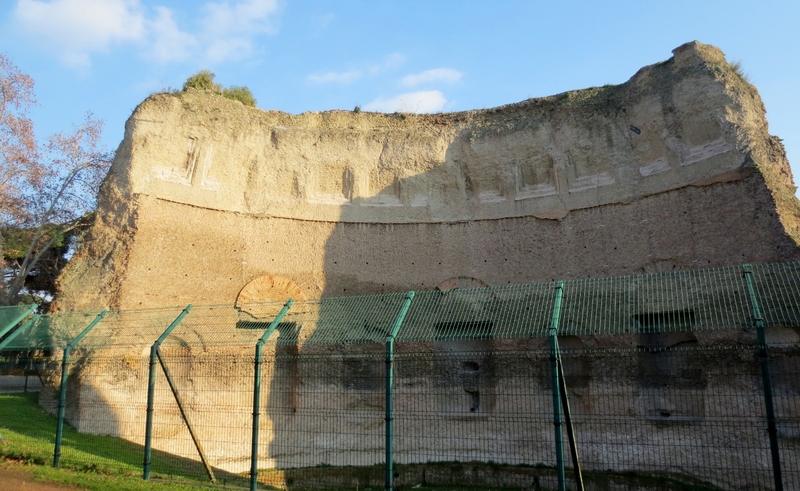 There were commissioned by Emperor Trajan and was more than 60,000 square meters in size. 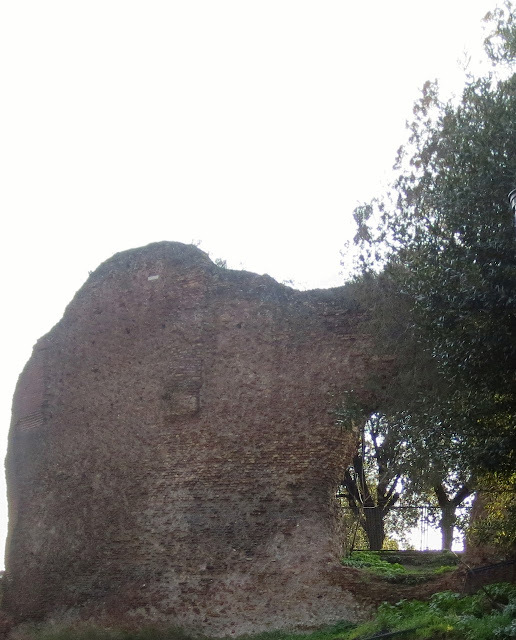 They were built by Apollodorus of Damascus and was used as mainly a recreational and social center by both men and women Roman citizens. 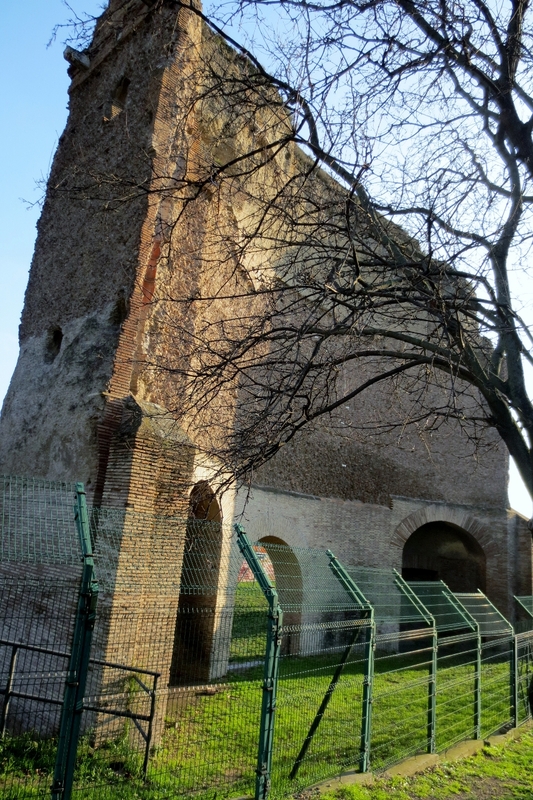 They were in use as late as the early 5th century and were deserted at the time of the siege of Rome by the Goths in 537 when the Roman aqueducts were destroyed. And we continue our walk. 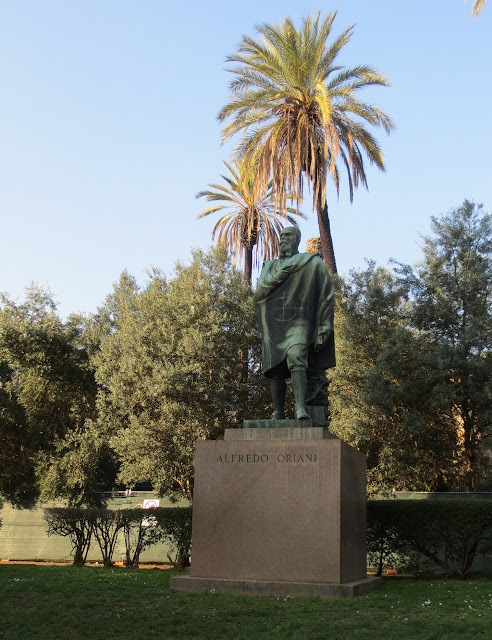 Alfredo Oriani (August 22, 1852 in Faenza – October 18, 1909 in Casola Valsenio) was an Italian author. It is just so amazing to me that we are in downtown ancient Rome and there are so many ruins and trees. You can almost imagine what it was like. I am SO happy that everything wasn't torn down to put in skyscrapers. Now we are getting hungry. 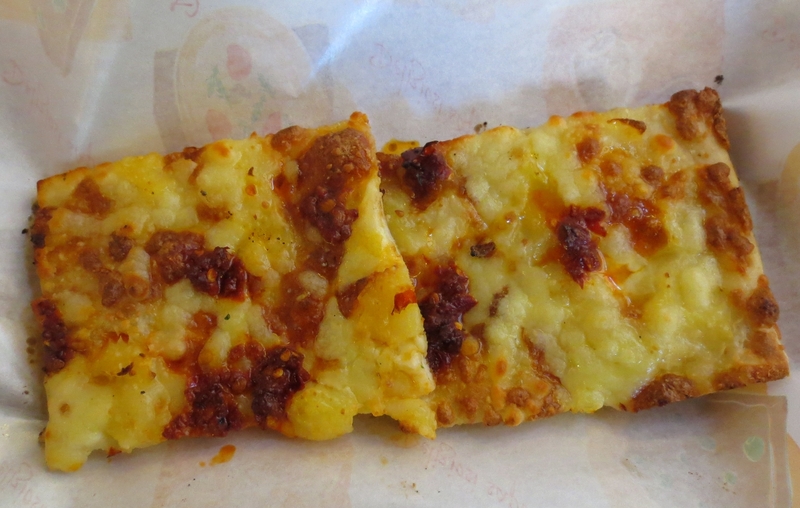 And since we are in Rome, I want pizza! 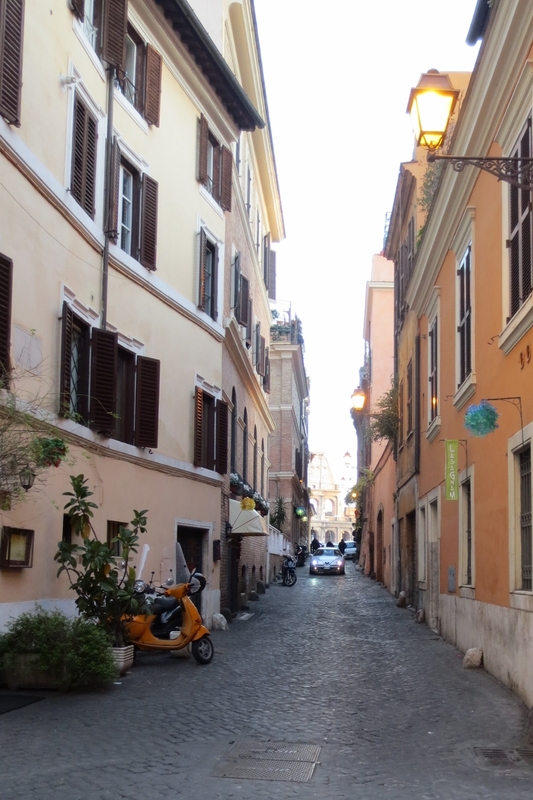 We came across a little place called La Cuccuma on at Via Merulana 221. Here you show them with your hands how big a piece you want, and you pay by the weight. This is my slice. 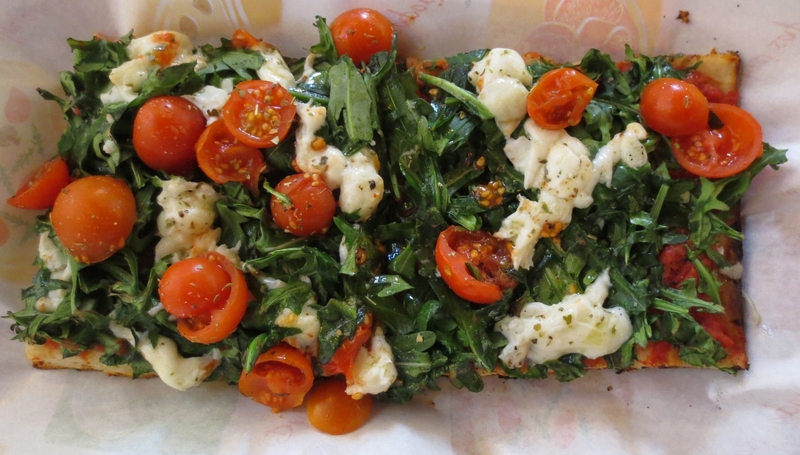 It has mozzarella, cherry tomatoes, arugula and basil. It cost €4,10. I'm not sure what Ron got. Probably something like Diavola (hot sausage). His cost €2,66. 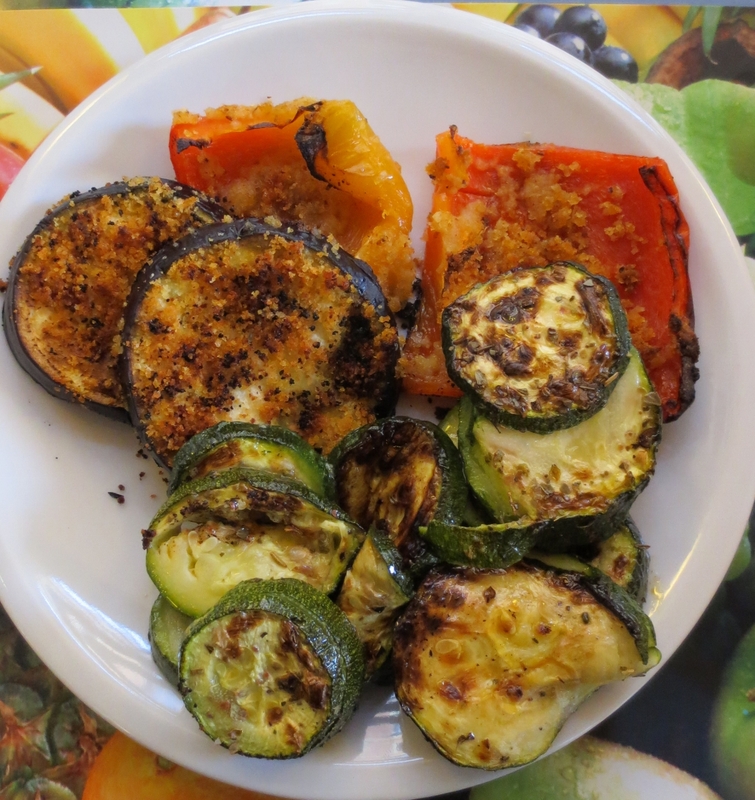 We also had a plate of grilled mixed veggies that was wonderful! We didn't know it at the time, but we found out on our food tour that restaurants are not allowed to used the wood fired stoves until after 7:00 pm. So, this pizza we picked out was then warmed for us in something like a toaster oven. They had more than just pizza though. Lots of different kinds of pasta. 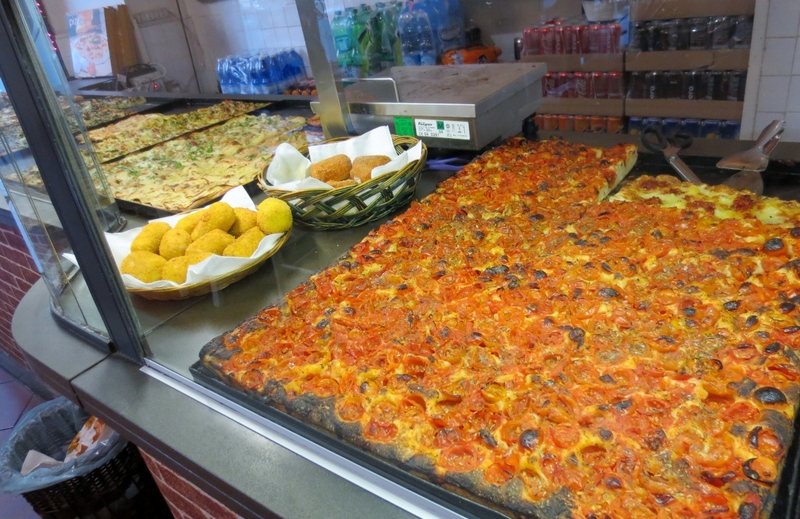 As you can see, they had lots of different kinds of pizza. And after a bite we start walking again. 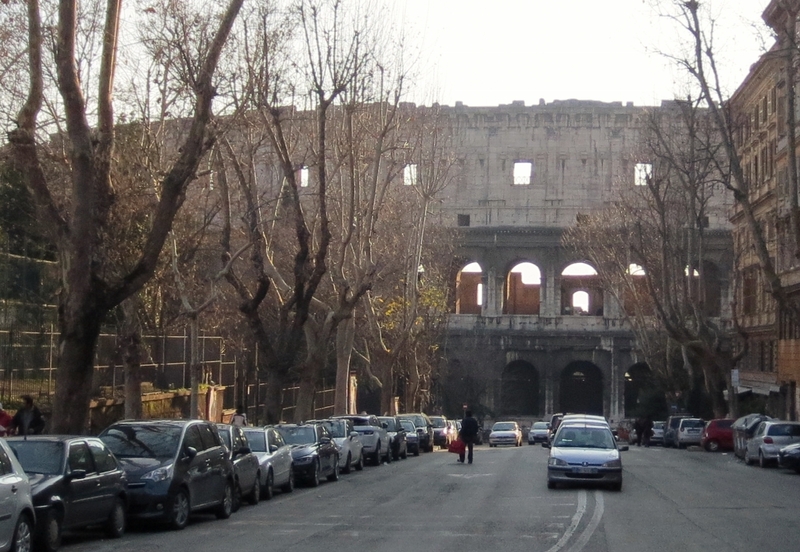 I just LOVE seeing the Colosseum every time we turn around. I got quite a few different views of it. We've been in it several times and figure we'll be going in it again in April so this time I'm just happy to see the outside. And my wonderful husband who instead of leaving me home when he has to travel for work, lets me come along and see the world. Just a random picture of a random street in Rome. LOVE IT! 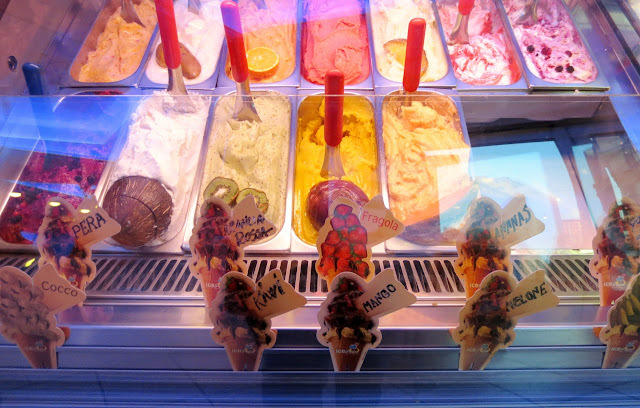 And then we end the day with gelato. But this was before we found out about the difference between real gelato and fake gelato. Which do you think this is below? 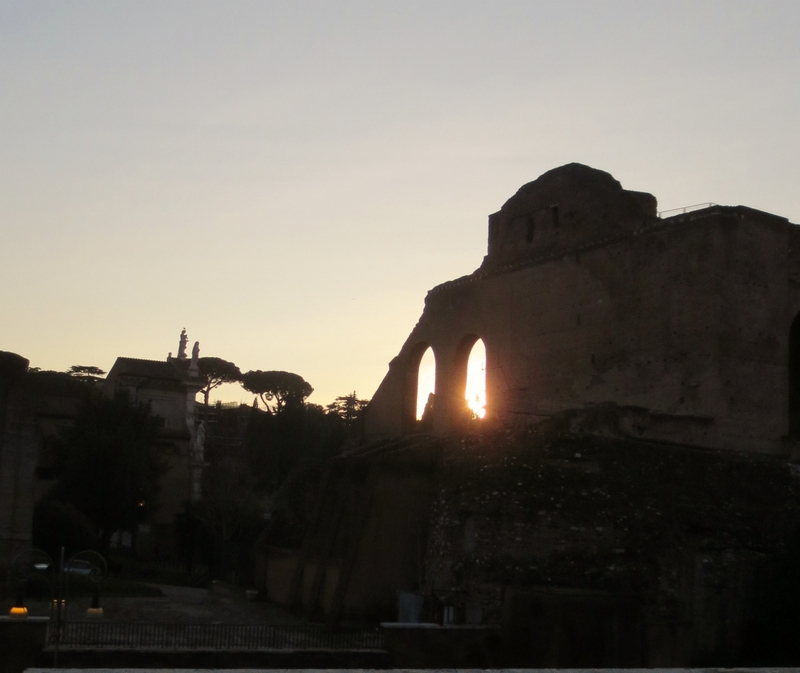 All this and it's only our first day in Rome. This is going to be an amazing trip! Ciao! I love this post! It's like we're walking along with you seeing these things! Now I'm motivated to do a bit on mine! Thank you! 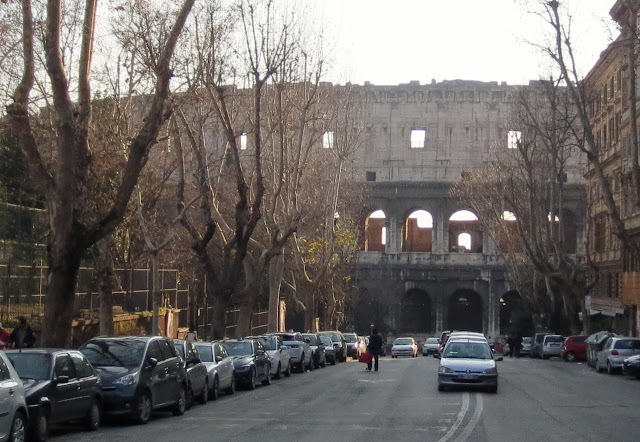 I still need to get to the one where you come and visit us in Rome. Let me know if you get yours done first!